Scotland’s Heritage is a unique book. 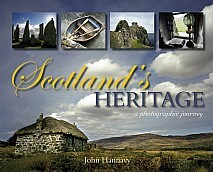 It combines John Hannavy’s stunning and original photography of Scotland with an engaging narrative on the country’s evolution from 4000 BC to the present day, using both the author’s own account of his travels with those of the great travel writers of the past who have explored and been moved by its landscape, architecture and people. Scotland is a country steeped in history, and blessed with a rich and varied heritage set in a stunning landscape. It is a photographer’s paradise with light which can change a hundred times a day, each revealing a new aspect of the place. Throughout the country, marks reveal the lives of those who have lived before us over past millennia, while today’s landscape is dotted with the remains of buildings erected, enjoyed, altered and abandoned over the past centuries. Scotland’s Heritage illustrates some of the country’s often-turbulent history by offering a view of the places and the buildings where that history was played out. The text and pictures in the book are arranged thematically with sections entitled The marks left by men; The land of the mountain and the flood; Great houses and humble dwellings; Churches, rituals and monuments; The land of a thousand castles; One thousand years of industry and Living and working by the sea. Travel writers from the last 400 years such as William Camden, Boswell & Johnson, Thomas Pennant, Daniel Defoe and H.V. Morton have all contributed their views on what Sir Walter Scott called ‘the land of the mountain and the flood’. The land they journeyed through and the experience of travel then was very different to what we know today, and quotations from their erudite, informative and often amusing observations are used to contrast their Scotland with ours. This unique and lavishly illustrated landscape format travelogue will be of immense interest to anyone with an interest in the history, culture and heritage of Scotland, and particularly to visitors.